The life of an amateur photographer in Hawaii must be depressing — some of the best photo ops are underwater. Without a crazy-expensive setup consisting of an underwater housing and lights, there’s practically zero probability that you’ll take home a great photograph. Every store has an 800-speed disposable camera at the checkout line, but you’ll be lucky to get a few pictures for the photo album with those. There’s no real use in blowing up one of those dark and grainy images. What can be done? Take your camera to the Maui Ocean Center! Oksana and I decided to spend half a day wandering around the aquarium. Initially I was skeptical, but it turned out to be money well spent. There’s hammerhead shark tanks and green sea turtle pens. There’s a massive pool with all manner of sharks and rays and a transparent tube you could walk through as you marvel at them. One never-ending series of darkened rooms held small, well-lit tanks containing all sorts of rarities you’d probably never see while snorkeling: shrimp and lobster, octopi, anemones, seahorses, glowing jellyfish, sand worms, and the like. We both had fun trading off the camera for the camcorder. Shooting in an aquarium has its own problems, though. With a tripod (which I didn’t have, anyway), one would be forced into using slow shutter speeds. 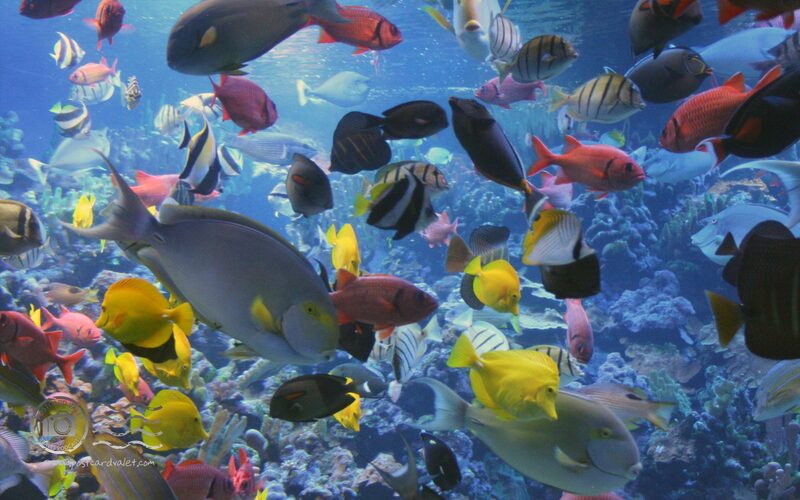 For fish that just sit there, that’d be fine, but most underwater life tends to move around… and blur. You can always shoot handheld with a flash, though… and get a nice bright reflection in the glass. So how did I manage to get this picture? Just lucky, I guess. I was snapping pictures of Oksana posing in front of the glass, getting bright flash spots or blurry fish in every one. It wasn’t really bothering me, though, because we weren’t going for high art, just some “I been there” photos for the inevitable Hawaii photo album. 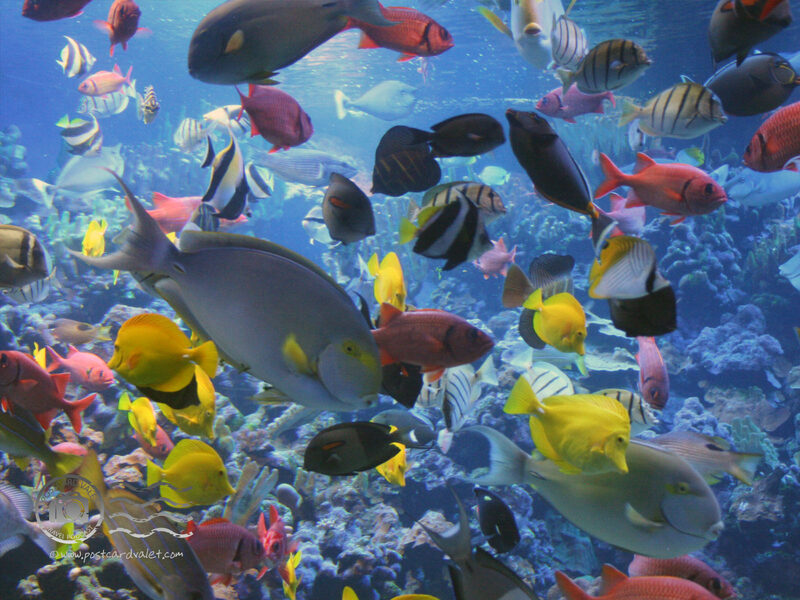 Oksana stepped away and I lowered my camera… and suddenly the tranquil aquarium burst into action. Within maybe three seconds, colorful fish appeared out of nowhere, darted left and right, all flashes of color and motion. I never saw what riled them up — feeding time or maybe a predator — but I did manage to bring the camera back up and snap a few pictures. There had been no time to think about flash, aperture, and shutter speed, I just went with the previous settings on the camera. Seconds later, the aquarium was back to normal. EXIF data reveals that my camera’s iris was wide open and the shutter speed was set for 1/100th of a second. That’s darn near the perfect setting for this situation. Any faster and the exposure would have been too dark, any slower and the fish would have blurred (via their movements or the movements of my hand), and a flash would have reflected in the glass. Lucky. It’s kind of neat how you can gauge the speed and direction of each fish was traveling by its amount of blur… otherwise, kind of lame. This is what’s called a slow-sync flash where the flash is fired, but the shutter stays open longer (to pull in more light where the flash may not have reached.) In this case, good for a still Oksana, but bad for a moving fish. I think I lucked out with the flash reflection. I’ll bet it would have been right behind Oksana’s head. I like this picture, by the way, even though it almost looks like Oksana was Photoshoped onto another picture. This is also about how dense the fish-to-water ratio was in the aquarium just before feeding time. Here the fish are frozen in place, so that’s nice, but note the flash reflecting in the glass. Also note that Oksana’s skin appears darker (than the above picture) when the flash and shutter speed are more traditionally aligned. It’s been a long time since I came across a set of photos that compressed so poorly in the JPEG format! Too much fine detail, I guess. All Content in A Midgett Blog is © 2003-2011 by Arlo Midgett. The written content of this blog currently exceeds 483,855 words.